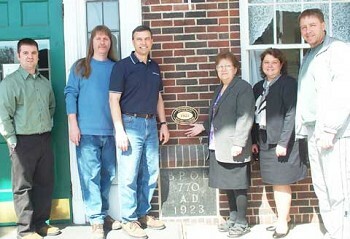 Perry and Beverly Nouis, center, were presented a plaque that designates their Pine Edge Veterans Home as a Little Falls Heritage Preservation Landmark. Making the presentation were city intern David Abel, and HPC members Gary Block, Deb Boelz of the Chamber and Bryan Hill. (05-08-05pineedge) Morrison County Record Staff photo by Joyce Moran.